This smoothie is very filling, almost like a full meal. It is packed with fibre, protein, vitamins A, C and E, calcium and healthy, mono-unsaturated fats. It is also ideal for those who are vegan or vegetarian (because of the calcium and protein). You can use acacia honey instead of the agave nectar if you are not vegan but I actually prefer the agave nectar. I also use soy milk but you can use any milk you prefer. This is one of my favourite drinks and I often make it for lunch as it fills me up quite well. You will need a food processor or a blender to make this recipe. I prefer to use a food processor and then transfer to a blender for a smooth finish although either machine will work fine. Place the 6-8 Brazil nuts in the food processor or blender. Blend for 1 minute or until very finely ground. Cut the avocado in half lengthwise. Gently twist the two halves in opposite direction if you find the flesh clinging to the pit. Remove the pit, either with a spoon or by spearing with the tip of a knife. Place the halves face down, then peel and chop coarsely. Peel the banana and chop coarsely. Place the following ingredients in the food processor (or blender): Brazil nuts, avocado, banana, 2 tablespoons lemon juice, 1 tablespoon agave nectar, 300 millilitres soy milk and 2 tablespoons bran. Blend for 10 seconds or until completely smooth. Pour into tall and wide glasses. You can use hazelnuts or macadamia nuts instead of the Brazil nuts. 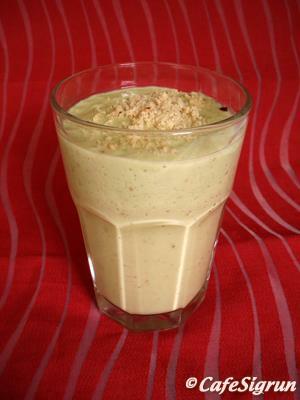 You can use soy yoghurt (or regular yoghurt) for a thicker smoothie. You can use almond milk, oat milk, rice milk or semi-skimmed milk instead of soy milk.